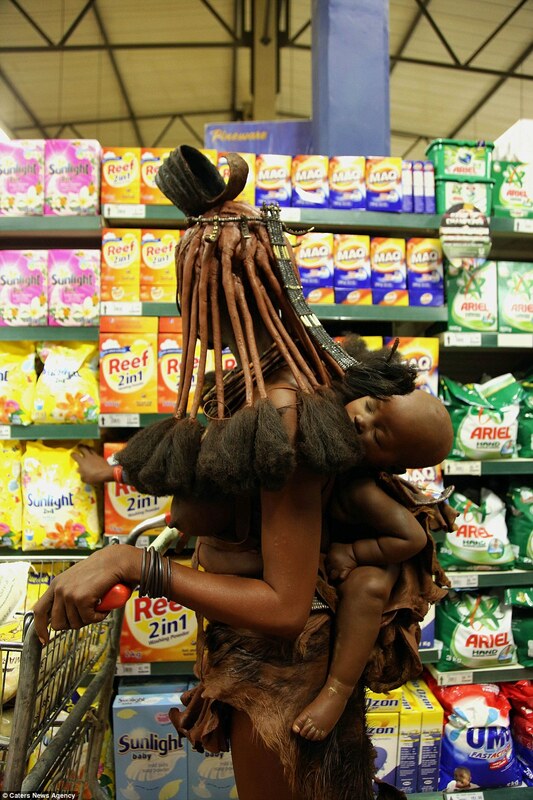 'The lady took me completely by surprise, as I was just doing my grocery shopping in a local supermarket while filming a documentary about the Himba tribe. 'She did not notice me at first, but after a while she realised what I was doing. The Himba women always dress like that, no matter if they are at home in their village or visiting the big, modern cities. 'It's for their own beauty and tradition. They don't just dress up for tourists as some other tribes do. 'The hair and whole body is covered with a certain kind of mud to protect them from the sun, and the clothes are mostly made of goat skin. 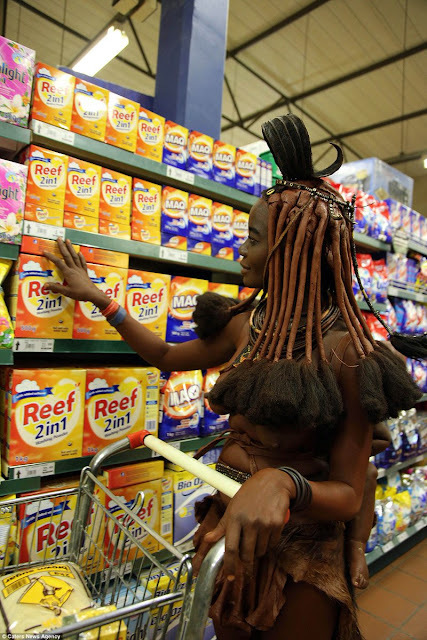 'She was just buying flour, sugar and washing powder. 'But I felt fascinated, confused, happy and sad all at the same time. 'The photos are a stark representation of the old world and traditions clashing with the new. Despite the striking contrast the images give, local shoppers did not pay any special attention to the Himba woman. For the other villagers, the tribeswomen's appearance at the store is not unusual. Bjorn said: 'They are used to it in that village, and so people did not stare.